Yom HaAliyah was marked on Sunday - and soon it might be an official holiday in Israel. 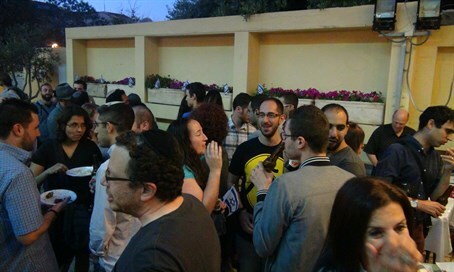 A special celebration took place on Sunday in honor of Yom HaAliyah (the day of Aliyah), which is celebrated on the 10th day of the Hebrew month of Nisan. It is on this date in the year 2488 of the Jewish calendar (1273 B.C.E) that the first mass Aliyah in history took place, when the Children of Israel crossed the Jordan into the land of Israel. Yom HaAliyah began as a grassroots young Olim movement and in March 2014 the Yom HaAliyah Bill was first submitted in the 19th Knesset as the next step in codifying the 10th of Nisan holiday in Israeli law. Yom HaAliyah “is the one thing on the Knesset table that everybody agrees on,” said Jonathan Javor, director at TLV Internationals, the organization that initiated the idea of codifying Yom HaAliyah into Israeli law. “It’s the one thing where we’ve got coalition and opposition, right and left, secular and religious, everybody’s supporting this bill and it’s a wonderful thing to see,” he added, noting that the group hopes the legislation will be completed by the end of the Knesset’s summer session.